Shakespeare’s Birthday has been celebrated in Stratford-upon-Avon for very nearly two centuries. 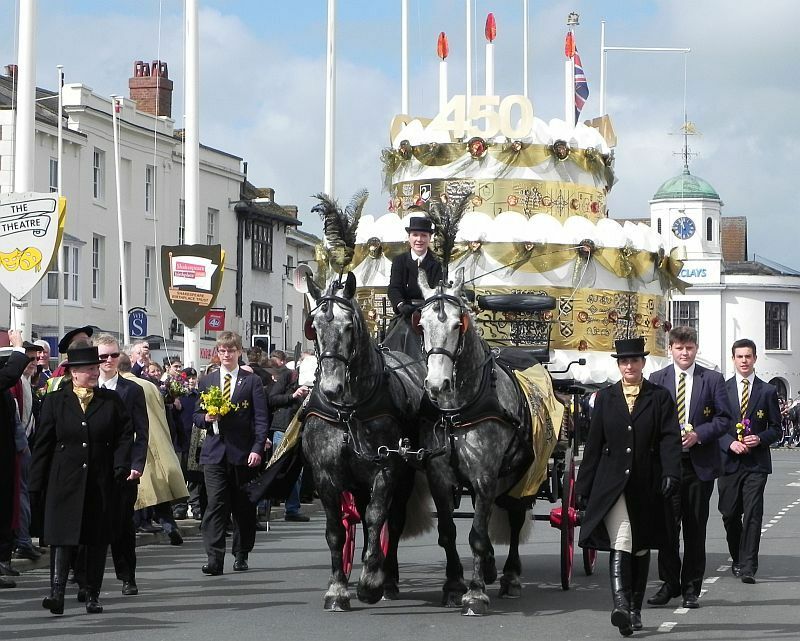 Over this period there have been many changes, but the floral procession from the centre of the town to Holy Trinity Church remains their central feature. It is headed by boys from King Edward VI School because the school initiated the custom of carrying flowers to be laid on Shakespeare’s grave out of respect for their fellow-pupil, a ceremony carried out every year since 1893. Much of the story has been reported by the Stratford-upon-Avon Herald, but I’m indebted to the School’s archivist, Richard Pearson, for sharing a newly-discovered volume of the School’s magazine, The Stratfordian, dating back to that first event. The idea of a special procession for Shakespeare began with the Garrick Jubilee in September 1769 though plans had to be abandoned because of torrential rain. Processions were a popular, if not regular, feature of Birthday celebrations from 1826 onwards. The Shakespeare Memorial Theatre opened in 1879 with the first professional production of a Shakespeare play on 23 April, that overwhelmed the town’s homegrown efforts to mark the big day. 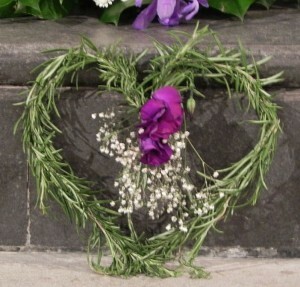 An interesting ceremony took place in Holy Trinity Church, Stratford-on-Avon, on Saturday evening[22nd]. 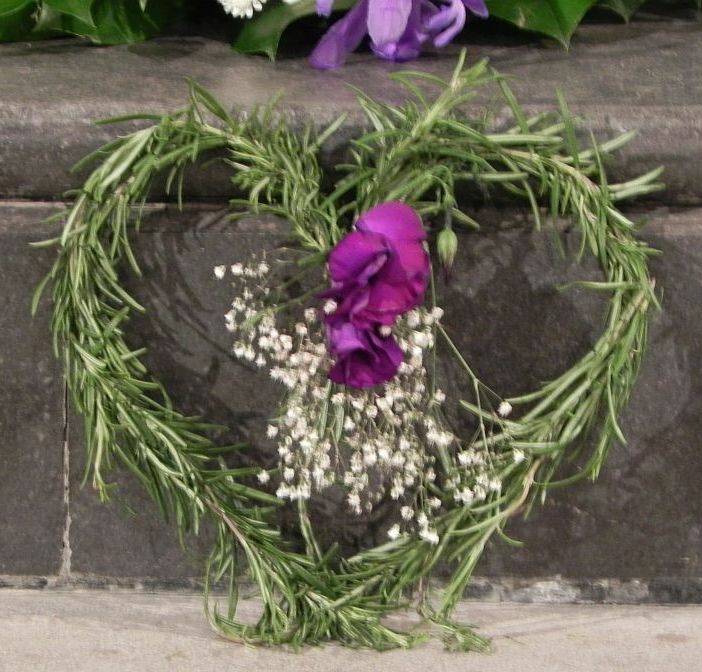 The head master (the Rev R S de C Laffan), the assistant masters, and the pupils of the Grammar School entered the church bearing a magnificent wreath, composed of arum lilies and stephanotis, which they desired to lay upon Shakespeare’s grave…. Mr Laffan, addressing the vicar (the Rev G Arbuthnot),…begged him to accept the wreath which they had brought as an affectionate tribute and token of reverence for their great and distinguished schoolfellow. The school magazine described the scene and went on: It was …a very pretty ceremony. It is to be hoped that every anniversary of the day will see it repeated. But as we filed past the grave, and saw the costly flowers lying on the slab, we could not but think how much more in accordance with what we know of the tastes of Shakspere, our offering would have been if it had been composed of simple wild flowers. 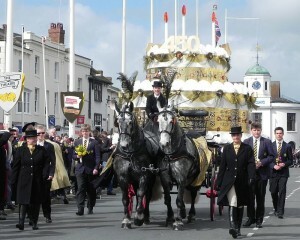 The procession was repeated the following year, during the day. As well as carrying a floral wreath, “The boys walked from the school two by two, each carrying a bunch of primroses” which they arranged on the poet’s grave in the form of a cross. In a sermon the Headmaster enlarged: “He had been in Frankfurt on Goethe’s birthday where streams of people brought flowers to deck his house. He should like to see the Birthplace and the tomb in that glorious church made beautiful with flowers on the day”. The Rev de C Laffan’s idea for a procession of children and ordinary people, not just officials, carrying offerings of wild flowers took off immediately. Although not originally intended as a public display by 1895 it was reported that people were coming to watch, combining spectacle and public participation. All the schools took part, and in 1898 the Vicar of Holy Trinity announced he would receive floral offerings in the Church from anyone who wanted to bring them. “Long before the hour appointed a large crowd had assembled…and…many could not get inside the building”. It was even bigger in 1899. “The nave, north and south aisles, and part of the transepts were filled with a congregation”. The Stratford-upon-Avon Herald noted that it was the inclusiveness of the ceremony that made it so successful: The custom of depositing floral tributes on the tomb of the great Poet is one that deserves encouragement. In years gone by the ceremony was a very perfunctory one, and was generally performed by half a dozen people. The Birthplace Trustees have invariably sent a wreath of bay leaves, and it was laid upon the tomb without anything approaching formality…Saturday’s function was a most impressive one. The tributes came from great and small. The former brought their wreaths, artistically fashioned, the latter their little bouquets of flowers, and some, perhaps, only a single bloom. One evinced quite as much reverence as the other. 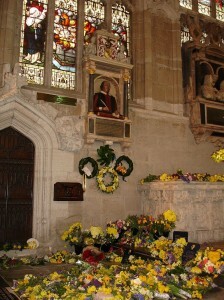 Lovers of his works are to be found amongst all classes, and now that it is the fashion to honour Shakespeare’s memory it is right and proper that the humblest student of literature and admirers of the Poet should have an equal opportunity with the greatest in the land of putting a posy on his grave on the anniversary of his natal day. With the church overflowing, in 1901 the Shakespeare Club (responsible for organising the celebrations) arranged for a procession to start at the Town Hall. The Club realised that its success relied on the informal charm of the school’s input. “Led by the boys of the Grammar School who revived this ceremony some years ago, many hundreds of people walked to the church”. This tradition took hold with the procession being headed at the Guild Hall by the headmaster and boys. In 1909 the Stratford-upon-Avon Herald noted that not long before it had been marked “by a dozen school boys making their way from the Grammar School to the church with a wreath and out of that simple act of homage …has grown the present long procession of pilgrims to the grave”. The sight and smell of the chancel of Holy Trinity Church carpeted with floral offerings is still to me the most touching part of Shakespeare’s Birthday Celebrations. If you would like to help ensure the long-term future of these events, why not join the new organisation Shakespeare’s Celebrations? Membership begins at a modest £7 and would make a very acceptable Christmas present for any Shakespeare-lover. This entry was posted in Legacy, Stratford-upon-Avon and tagged Holy Trinity Church, King Edward VI School, Shakespeare Club, Shakespeare's Celebrations. Bookmark the permalink. This is incredibly interesting and very helpful. As we are nearing the end of 2014, I look forward to the Celebrations in 2015 together with all our new Friends – thank you for promoting this too.